Davis got a tattoo on his left arm that’s in plain sight whether he’s himself or Big Nasty. “I’m not ashamed of what I’m about,” Davis says. “This is the bottom line.” It spells JESUS. It’s overcast and the air is stagnant – as if holding back a breath. Shaun Davis’ pickup has arrived. Once the truck’s turned off, there’s the click of the driver-side door handle and a mashing of metal as the door lunges wide then is elbowed shut. Out steps a hulking mass of man whose biceps outwidth most waistlines. Beneath coffin-colored eyes he speaks, extending a fist. There’s a gust of wind – but no rain. In the wrestling ring, when he’s suited in leather pants and boots, he’s known as “Big Nasty,” a nickname teammates gave him when he was the starting fullback on the Missouri Valley College football team. Davis grew up in the heart of the Kansas City ghetto, living with a single mom in ramshackle homes at 38th and Bellefontaine, 35th and Olive, Troost, Prospect. His mother was never around as she worked three jobs, one of which was steel factory worker. Davis never knew his biological father, a Vietnam War veteran driven to suicide when Davis was too young to remember. “I grew up mad at everything,” he says. he fact that Davis was bigger and stronger than most other boys never alluded him in his youth, when he was arrested dozens of times for fighting – or, as he puts it, “beating people up” – stealing cars and other crimes. Fearing for his future, his mother moved into the Fort Osage School District for his high school years, where he was a standout in track and field, football and wrestling. He never did qualify for state in wrestling, however. Not because he couldn’t toss guys like an agitated King Kong, but because he said he couldn’t accumulate the practices necessary to advance since he was invested in football the first six or so meets of the season. Davis also found himself wanting to fight his stepfather, who married his mother when he was 9. Upon enrolling at Missouri Valley College – where he was on scholarship for football and throwing the shotput – Davis’ anger toward his step-father reached fever pitch, tearing a fissure in their relationship that still shows cracks today. For a time, Davis was barred from coming near his parents’ Buckner home. “I was not the nicest dude to be around,” Davis says. Playing football at Missouri Valley College was a mistake for Davis, who signed his letter of intent alongside a childhood and high school friend of equal, if not greater, skill. When Davis heard that his buddy was going to Missouri Valley College, he kept his word. Davis lasted two years at the college, which was heralded for its football program, not its facilities. Even though Davis dropped out, he still felt he had the talent to play professional football, hiring a family friend who was an attorney to act as his agent, sending videotapes to leagues nationwide. It took two years before he was granted a private workout with the United Indoor Football Association. He got a contract and ultimately played for a number of arena football teams over a stretch of six years, including a stint with the Iowa Barnstormers where Davis blocked for an exceptionally efficient quarterback who was, even then, known for the five o’clock shadow on his face. His name: Kurt Warner. “Brother, those were some fun years,” Davis says. But at 28, Davis opted to retire from football; it was taking its toll, even for a 6-foot-3 guy and built as thick as an Angus bull. avis never foresaw professional wrestling in his future when he was approached in Evansville, Ind., by a stranger asking him if he might be interested. “I kind of laughed at him and told him no,” Davis says. But the stranger didn’t relent, promising Davis stardom – if only he would come and watch one show. So Davis did. He was shown a front row seat in a venue no larger than an elementary school gym. But that didn’t bother Davis, who believes wrestling shows must be no different before 50 people than 50,000. Davis knew he could do it – and do it better. “I told the dude, ‘Yeah, I’ll do it,’” Davis says. The stranger nodded his head and gave him a slip of paper with some digits and letters scrawled on it. The name was Bryan “Bad Business” Brown and through him Davis would kick-start a career in kicking tail. Eleven years later Davis is a veteran of the sport, the type of personality barked at by legions of wrestling fans when at restaurants, a ball game or the mall. s a wrestler, the scratches, bumps, lumps and scars from football have multiplied faster than a medieval disease, leaving in their wake a man who defines intimidation. “Did I mention I did extreme hard-core for a while, too?” says Davis, eyeballing a scar on his left forearm. In extreme hard-core wrestling, objects such as staple guns and weedeaters are within bounds. Davis has been to 46 of 50 states and wrestled for WWF (now WWE), WCW, ECW and too many podunk leagues to mention. Davis went 25 matches before he got paid, and it came in the form of a crumpled $10 bill. Today, Davis said he makes considerably more than $10 a match, but he’s earned it. According to Davis, making a living as a professional wrestler is a commitment to the road and a physical and psychological beatdown harsher than what you’d find at a lot of prison camps. “I’ve paid my dues,” he says. Davis was only able to train with Brown for three months; a heavy-drinking biker from St. Louis and one-time member of the WCW’s Dog Catchers, Brown died of an aneurysm at 31. “He was a super nice guy,” Davis says. With tragedy came opportunity, as Brown’s passing created a void. Chris Champion – best known for his tag team duo with Sean Royal called The New Breed – stepped forward. The two immediately became close friends, working together on nearly a daily basis. Champion was trained by Dean Malenko, who was the WWF’s head trainer. “Dean had way better skills than any clown on TV, and he taught Chris well,” Davis says. Champion enforced a grueling weightlifting and workout regimen – including a drilling in Memphis-style, or old-school, wrestling in which wrestlers lock up and go through a series of moves; its mastery is what separates professionals from amateurs. But it isn’t the physical side of the business that eliminates pretenders; it’s the psychology. Champion showed Davis that the hardest work in professional wrestling isn’t the training or the performances. It’s what happens behind the curtain in the back of the house, where in-ring opponents gameplan and storylines come into fruition. avis is well en route to developing a professional wrestling organization in Kansas City he’s coined Xtreme Wrestling Action. He visualizes it as a weekly show at a medium-sized venue in the Power and Light District that will also function as training headquarters. “You know, a place I can set-up a ring open 24 hours a day where area guys can come and bounce off the ropes,” Davis says. Davis says you have to exist in the industry and know its people on-stage and behind it before you can dream of founding a league. Davis has already got commitments from scores of forgotten superstars from every major wrestling organization, including Chris Jericho. Davis’ XWA counterpart is Jordan Rogers, a Blue Springs native who founded KC Anthem, a Web site (www.kcanthem.tv) devoted to Kansas City’s music underground, offering comedic sketches and video interviews with local bands. “Don’t you think he looks the part of general manager?” Davis says. In addition to helping with the creative elements, the general manager traditionally plays the part of villain, hated by wrestlers and fans alike. Rogers is sporting a renegade goatee, cut-off jean shorts and a faded Nirvana T-shirt. Aside from being a video maestro (Davis actually contacted Rogers after viewing his Web site; Davis would like to air recaps of the show every Saturday morning on local television), Rogers is a lifetime fan of wrestling and at odds with the shape of the sport at present – no thanks to Vince McMahon, whose control of professional wrestling is without limits. According to Davis, independent wrestling leagues are the preferred setting for wrestlers who have been in the business for 15 to 20 years. 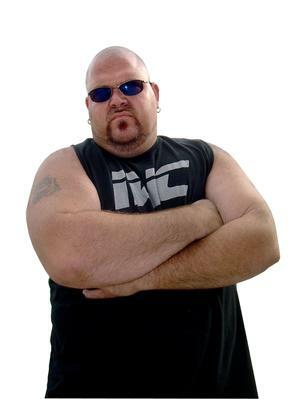 Until XWA is official, Davis is, well, Shaun Davis, a larger-than-life but well-to-do can’t-I-be-your-neighbor. In his early years of professional wrestling, the division between Shaun Davis and Big Nasty barely existed, if at all. “I was Big Nasty all the time,” Davis says. The adrenaline rush he got from performing riddled him like a lightning bolt, charring his personal life. At one point, he had to leave wrestling for a year to diffuse the two identities. Then Davis got a tattoo on his left arm that’s in plain sight whether he’s himself or Big Nasty.